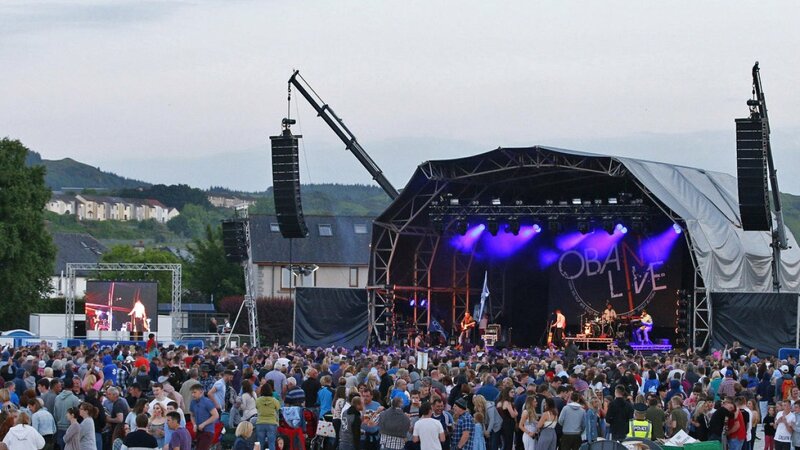 Argyll’s biggest outdoor music concert Oban Live came to a close last night, Saturday June 9, tallying up an attendance figure of just under 8,000 attendees over the two-days. Thousands of revellers made their way to Mossfield Stadium in the rural coastal town of Oban in the west coast of Scotland for the incredible spectacle, which transforms a shinty sports field into a major concert arena. For a third year running, the massive cultural west coast party entertained visitors from all over the world, from as far as Australia and the USA, with an eclectic mix of Scots ‘Trad”, folk, pop and rock music, taking over the town which has a population of 8,000. Friday enjoyed a whole day of glorious sunshine and, despite mixed forecasts, the event luckily escaped the rain on Saturday as the sun shone in time for gates opening, staying dry for the rest of the evening. Friday’s line-up included a stream of incredible acts including Blazin’ Fiddles, Hermitage Green from Ireland, Tide Lines and headliners Skipinnish. 19 year old solo/singer writer Kathleen Robertson, winner of the local Oban Unsigned competition, opened the show with a stunning set. An impressive all-star line-up of 24 top names in the Scottish traditional music industry also came together on Friday, exclusively for Oban Live, in an emotional collaboration named ‘Sons of Argyll’. The project paid homage to late inspirational figures from the region that played a key role in the lives and music of the performers involved. Musicians from Tide Lines, Skipinnish, Skerryvore, Blazin’ Fiddles, Trail West and Gunna Sound, as well as this year’s Mòd Gold Medallists, Rachel Walker and Alasdair Currie, members of Oban Gaelic Choir and world class pipers, and many more well known names in the industry, were included in the project line-up. The party continued on an even busier day on Saturday, welcoming on stage Rhuvaal, local band Chunks, Heron Valley, Sharon Shannon with Michael McGoldrick and Susan O’Neill, Peatbog Faeries and ending with a spectacular finale from headliners and festival founders, Skerryvore. The multi award-winning eight piece male line-up, firm favourites on the festival scene, launched their sixth studio album Evo at Oban Live, just days before its official June 11 release on the Tyree Records label. A highlight for the weekend was the mind-blowing moment when Oban High School Pipe Band joined Skerryvore on stage for a performance of Soraidh Slan and The Rise, new tracks from Skerryvore’s Evo album, complete with light-up drumsticks. People also tuned in from all over the world as the moment was live streamed across social media channels.